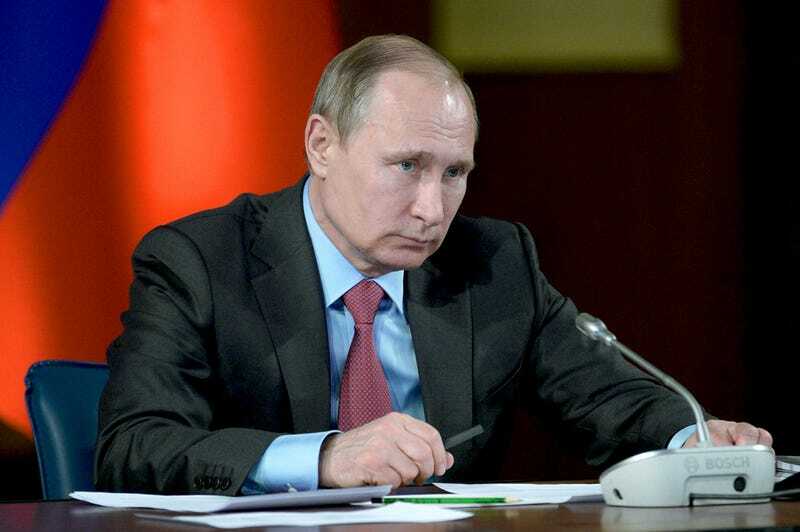 In what seems at face value as a stunning turn of events, Russian President Vladimir Putin has ordered the withdrawal of Russian military forces from Syria. The move comes after just a scant couple of weeks of calm, as the ceasefire between Syrian rebels and Assad’s Russian backed forces has been enacted. There have been small hints at a possible scaling down of Russia’s involvement in the Syrian conflict, with reports from Russian media stating that the Kremlin is “satisfied” with the ceasefire situation. Still, that is a long way from announcing a pull-out of most of Russia’s forward-deployed firepower. The seat of Russia’s military might in Syria is located at an air base south of the port city of Latakia. The airfield has been almost totally remodeled over the last eight months, and features everything from new helicopter pads, barracks, and even Russia’s most advanced surface to air missile system, among a host of other improvements. And then there’s also the 50 or so jets and helicopters that call the base home. In all, Russia executed an impressive logistical undertaking using its massive An-124 Condor transports and shipments of cargo via the Black Sea to rapidly develop the outpost and deploy aircraft to it. With this in mind, vacating it now would not be an easy (or cheap) task. If indeed these assets return to Russia, and Putin’s statement is not part of one of the Kremlin’s shadow plays that they have become so well known for, it will help to define Putin’s actual goals for the Syrian excursion. First off, it did save Syrian dictator and Russian ally Bashar Al Assad from what looked like looming defeat, at least temporarily. Yet that was clearly only part of the mission’s objectives. It also elevated Russia as a major power player in the Middle East, and made it very clear to the West that it is now able and willing to mould world events far from its own borders. It also served as a strong example that Russia will stand by its allies, regardless of how hated their are in the international community. And finally, it was a giant infomercial for Russia’s military might and flourishing weapons exports, almost to a comical degree. All this will have come without the public’s falling opinion of Russia’s involvement in the conflict dropping too low, and without it being an open-ended liability on the Kremlin’s shrinking financial statement. Now we will have to wait and see if Russia actually does what it says it will do and exits Syria militarily to a large degree. If it does come to pass, it will be interesting to see what will their involvement will look like going forward, especially if the ceasefire fails. Will Russia be willing to reengage if Al Assad’s rule becomes threatened once again? There is also one potential contributing factor that could have catalyzed this seemingly sudden decision by Moscow to remove its forces from Syria, the majority of which is air power. As far back as the start of Russia’s aerial combat operations over Syria we noted how shoulder-fired surface-to-air missiles would have counter-balanced their airborne might. Russia’s aircraft, regardless of how advanced they were, were largely flying dumb bombing missions at low- to medium-altitude, and often in broad daylight. Almost all of Russia’s active fleet of tactical aircraft lack missile launch warning detectors and modern directed infrared countermeasures. As such, the introduction of man-portable air defense systems (MANPADS) could have turned what was a free for all real-world bombing range for Russian aircrews into an incredibly dangerous bloodbath. The thing is that there were growing signs that Syrian rebels were beginning to get armed with these weapons. Even the Saudi Foreign Minister posited that supplying these missiles to Syrian rebels may be a needed tactic if the Russian air war cariries on. Then, just last weekend a Syrian MiG-21 was shot down by Syrian rebels using a MANPADS missile. This ominous event could have been a glaring sign of things to come for Russia who had only lost two aircraft during their Syrian air campaign thus far. One was an Su-24 shot down by a Turkish F-16 and the other was a Mi-8 helicopter that was part of the search and rescue operation for the Su-24 crew. It landed due to a mechanical issue and was destroyed by a Syrian rebel’s TOW anti-tank missile. If Russia realized that MANPADS were being introduced into the Syrian conflict, the same types of missiles that turned the tide of the war against them in Afghanistan in the 1980s, continuing with the air campaign may have been considered far too risky and/or expensive. Expensive, on the one hand, because Russia would have to begin bombing from higher altitudes and, ands it would have to increase nighttime operations. The only way to do that with any real precision at all is to use precision guided weapons, which are very expensive. So far, Russia had fought the Syrian conflict on the cheap using mainly dumb bombs. No matter what, Russia would no longer be able to put up massive claimed number of sorties and pounds of ordinance dropped under these modified operating procedures. The current ceasefire has given Russia a seemingly clumsy and hasty but still executable exit from the conflict. The Kremlin can claim victory and withdraw, even if it seems suspiciously premature. By leaving now and doing so quickly, Russia would not have to be suddenly thrown back into the conflict, executing an air campaign that may be far more deadly than in months past.